Tim Burton’s ‘Nightmare Before Christmas’ was an instant cult classic. Even to this day, people hold viewings to sold out crowds, dress up as characters from the film in public, and all the merchandising riddle clothing shops, toy stores, book stores, and gifts shops around the globe. ‘Nightmare Before Christmas’ is an amazing achievement in filmmaking. This film has already been released on blu-ray, but Disney has converted it to 3D. This version comes with the 3D Bluray, 2D Bluray, DVD, and Digital Copy. Another great version to this timeless classic. Loved it. This short 76 minute film film is all done in the style of claymation meaning it is all stop motion animation with clay. Truly a feat in filmmaking. I wish this film were a little longer to explain some plot lines out, but over all this film is wonderful. Set on what looks like Earth, is a doorway to far off worlds where each American holiday has its own world. A world for Christmas, a world for Thanksgiving, a world for Halloween, and so on. Of course being Tim Burton, we are whisked away to the world of Halloween where monsters live. The monsters are not mean. They just live their day to day life planning for the next year’s Halloween. The leader and mascot of the town of Halloween is a very tall and skinny skeleton named Jack. Jack is depressed and longs for something new and purpose in life. He is tired of being the go to guy and performing on Halloween. On a long walk he stumbles upon the doorways to the different holiday worlds and he becomes fascinated with the Christmas doorway. He steps in and is whisked away to the town of Christmas. He immediately loves the place learning all the traditions and somehow missing the meaning of the whole spirit of Christmas, but you see Jack means well. So Jack travels back to Halloween town and tells all the residents about this Christmas town and he plans on “Making Christmas” Halloween style. There are wide variety of lovable characters and a killer soundtrack which is comprised of original music that is just sweet sweet music to the ears. This truly was great to see again and in 3D and back on the Disney label. Disney did not want this film on their “Disney” brand because someone high up thought it would be too scary and dark for kids. But with this release, “Disney” is all over the film and packaging. Originally back in 1993 this movie was not made in 3D. It was a regular 2D production. But in 2006, it was converted to 3D from the 2d print which marked the first time that a 2D print was converted to 3D. It was done with tons of love, passion, and care that it turned out great. Better than most of the 3D conversions today. The 1080p/MVC transfer on the Blu-ray 3D disc has been altered to a full-screen aspect ratio of 1.78:1, which is slightly cropped on the top and bottom in comparison to the pillar boxed 1.66:1 transfer of the 2D version. For this 3D release, some minor changes have been made to the film. Some of the strings that were noticeable on the bats flying around have been erased and the end credit sequence has been changed to be 3D with some ambient darkness in the background. It looks really cool. Probably the best sequence in 3D is the first scene where the song ‘This is Halloween’ is playing and we are flying through town and meeting all the characters. Through most of the film, the 3D is so good, that you literally think you can step into the world of Tim Burton and touch al the surroundings. Sometimes the images feel flat, but it does not take away from the film. As for the comparisons from the 2D and 3D versions, the 3D version is slight darker and a tad bit grainy here and there, but not really visible to the untrained eye. Plus anything that is converted to 3D will be darker. But the colors vibrantly pop and great textures all around. Truly remarkable video presentation. The audio is presented in the TrueHD Dolby 7.1 mix. This is the same as the 2D version. The full sound boasts on all the speakers with crisp clear dialogue and music. All the little monsters and critters can be heard all around you. Near demo worth audio. Introduction by Tim Burton (18 sec.) – Tim Burton really just says that he thinks this movie is awesome and that he thinks you will love it too. That’s it. A let down. Audio Commentary by Tim Burton, director Henry Selick, and music producer Danny Elfman – Very informative and sometimes fun commentary track, but the track is from three different recordings and feels kind of jumbled. What’s This? Jack’s Haunted Mansion Holiday Tour – On Track Version (7 min.) – A promotional video for the Disney ride with trivia. What’s This? Jack’s Haunted Mansion Holiday Tour – Off Track Version (37 min.) – A longer version of the above promotional video of the ride, but with interviews with Disney’s engineers and without trivia. Tim Burton’s Original Poem (12 min.) – The poem that served as the inspiration for the film is narrated by Christopher Lee and illustrated with brand new animation based on Burton’s original concept art. In this version of the story, Jack is much more of a Grinch-like character. Must see this extras. AWESOME. Frankenweenie (30 min.) – Tim Burton’s 1984 short film stars Shelley Duvall and Daniel Stern as the parents of a young science whiz who brings his recently-deceased dog back to life through the miracle of electricity. The local townsfolk don’t react well to the discovery. The Blu-ray contains the extended director’s cut version of the film. The piece is preceded by a new video introduction in which Burton plugs his upcoming animated remake. Very cool. Vincent (6 min.) – Tthis early stop-motion animated short by Burton illustrates a poem narrated by Vincent Price. 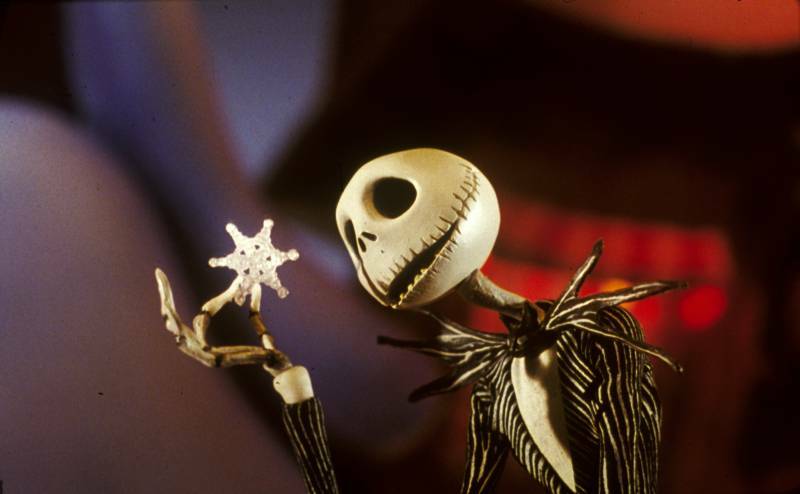 The influence on ‘Nightmare Before Christmas’ is all here. Anything with Vincent Price is gold. Plus you will get to se some early work on Jack Skellington. Deleted Storyboards (3 min.) – Storyboards for three deleted sequences (including an alternate ending) are presented with commentary by Burton explaining why they were dropped. Deleted Animated Sequences (5 min.) – Three scene extensions and one new scene made it all the way through to completed animation but were eventually cut for from the film die to time constraints. The Making of Tim Burton’s The Nightmare Before Christmas (25 min.) – A fun documentary that shows all the aspects of making the stop animation film including production and interviews. Halloween Town – Some still galleries of the characters and test footage from the making of the movie. Christmas Town – Designs and concept art for Santa and his Helpers. The Real World – More still galleries devoted to the poor townspeople Jack terrorizes with his Christmas ideas. Storyboard-to-Film Comparison (4 min.) – A comparison of storyboard to screen of the town square meeting. Posters – A short still gallery of all the posters and designs. Trailers (4 min.) – The two trailers for the film. 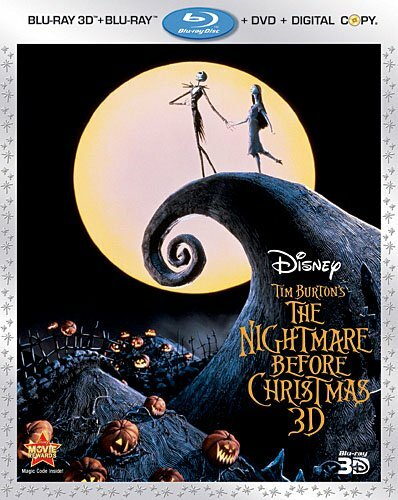 I will say that this is the definitive edition of ‘Nightmare Before Christmas’. It has everything the previous blu-ray version had, plus the 3D. And the 3D is not bad. It actually looks really good. The sound and video look amazing and the extras are a plenty. 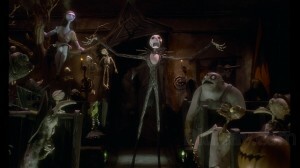 3D or not, ‘Nightmare Before Christmas’ is an instant classic and is really just an amazing movie. I highly recommend getting this. Can’t wait to start watching this again around the holiday season. This entry was posted on Wednesday, August 31st, 2011 at 3:29 pm	and is filed under Film. You can follow any responses to this entry through the RSS 2.0 feed. You can skip to the end and leave a response. Pinging is currently not allowed. « Terrence Malick’s ‘Tree Of Life’ Blu-Ray Announced and Detailed!!! [voice over] Where is it that we were together? Who were you that I lived with? The brother. The friend. Darkness, light. Strife and love. Are they the workings of one mind? The features of the same face? Oh, my soul. Let me be in you now. Look out through my eyes. Look out at the things you made. All things shining.